Experts from Defence Equipment and Support’s Personal Combat Equipment (PCE) Team have been working hard to create a fully-integrated line-up covering everything from body armour and backpacks to boots and gloves. It’s a modular system that has been developed to work together,” explained Warrant Officer Class 1 (WO1) Dave Sharp of the PECOC trials team. “For example, the glasses work perfectly with the helmet and you can also use pouches which can be added on. We are trying to integrate all the kit, making it work together as a better system. It has also got to work with the vehicles and sighting systems. The equipment list for PECOC encompasses ballistic and sensory protection, load-carriage, clothing, footwear, gloves and sleeping bags. It’s due to come into service in 2012 and we will know if it’s going to go through in January,” added WO1 Sharp. “The idea of PECOC is to make us a better fighting force. As well as providing a high level of modularity, weight distribution was one of the key concerns for the PCE Team, which decided that several lighter components were better than one heavy load pulling a soldier down. PECOC encompasses this aim with the inclusion of a load-carriage system integrated with the assault vest and close-fitting fragmentation and bullet-proof plate. Troops taking part in missions of up to two days will receive a specially-made backpack, while those heading out on the ground for longer periods will deploy with a larger Bergen optimised for heavier loads. Our challenge is to make it as light as possible while maintaining protection. The aim is to allow soldiers maximum flexibility. They need to be able to mix and match equipment for their roles and tasks for the day. We wouldn’t expect to see any two soldiers wearing the same combination of kit and we want to give maximum flexibility and the ability to carry kit when it suits the soldier. 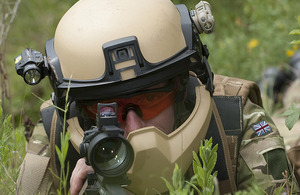 Personal combat equipment which is easily customised, comfortable, and allows for speed on foot for extended periods tops many soldiers’ operational wish lists. With PECOC, that is exactly what they could get. This report by Joe Clapson first appeared in the August 2010 issue of Soldier - Magazine of the British Army.